PARIS 2e: Run, you fools! 1 Comments Published by Cedric Benetti on Monday, October 12, 2009 at 10/12/2009 12:11:00 PM. One of the fun things in October in Paris is the start of the running season. This sunday, 22.200 amateur athletes and professionals took part in the popular "20km de Paris" race, a race with no restirctions of age (you have to be 18 at least) or other issues. People who run here are by no means professionals or try to beat a record, they just want to run through Paris. 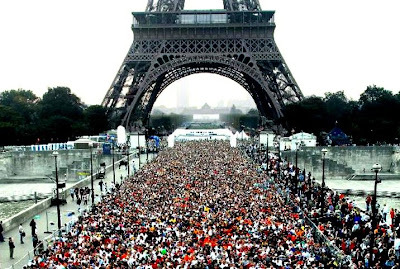 The race which starts and ends underneath the Eiffet tower each year, celebrates its 30th year of existence, and everyone in the world can sign up to join in the fun. 22.200 amateur athletes and professionals running...just because they can run in a race.